Paramore: they were once the emo day dream of our youths. With sharply cut bangs, hot topic clothing, and lyrics charged on teenage angst, they were the signature pop punk band of the 2000’s. 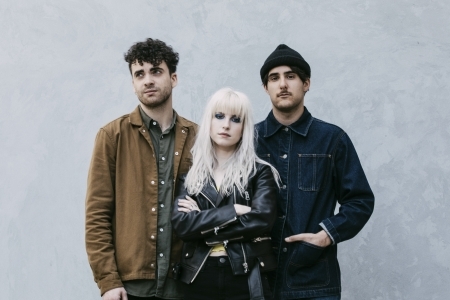 But after years of internal struggle their latest album After Laughter is a revival of their image when all they really wanted to do was give up. Yet despite all the pain they’ve come out with After Laughter, a tribute to the pain they're facing and a way to express all thatss been trapped up over the last few years. It’s a brilliant rebirth of Paramore’s old sound, and although it has been noted that it’s a long distance away from their previous albums - All We Know Is Falling, RIOT!, and Brand New Eyes - it has that same crisp 80s sound that their Grammy award winning “Ain’t It Fun” had. the best is over and the worst is yet to come. to keep hoping when the rest have given up?" Mixed amongst these perky sounds are a lot of moody and seething songs. “Forgiveness” and “Fake Happiness” are a soft transition from the upbeat to the more downbeat, keeping the similar guitar style but at a much slower pace and with a darker bass line. The tracks “26”, “No Friend”, and “Tell Me How” bring the album to its darkest points and in the process they really expose how much Williams was battling with. Her anxiety, confusion, and anger are brought to light in these tracks, showing the confusion Williams is facing over if she is the self-centred diva the Farro letter said she is, or if having grown up in the high-pressure environment of being musicians created tension or toxicity that has led to everyone lashing out at what they perceived as an easy target? "Man, you really know how to get someone down. Everything was fine, until you came around"
After Laughter is a powerful, emotional album that feels like sour candy on the ears. It’s brilliant, colorful pop music, and yet it leaves a bitter taste from the lyrics that strike a chord with anyone who has felt belittled, confused, depressed, or angry. I can sabotage me by myself"
Overall, this is a fantastic pop-rock that still holds true to Paramore’s origins but shows the growth that a person is forced to make in times of hardship. It’s a continuation of their “too pop for rock, and too pop for rock” style and a perfect mechanism to help the band get over the biggest hurdles in their life and include their loyal fans in that journey.